The entire video of the thrashing of the SI by the BJP councillor went viral in the social media which led to an embarrassing situation for the state police and the ruling BJP. 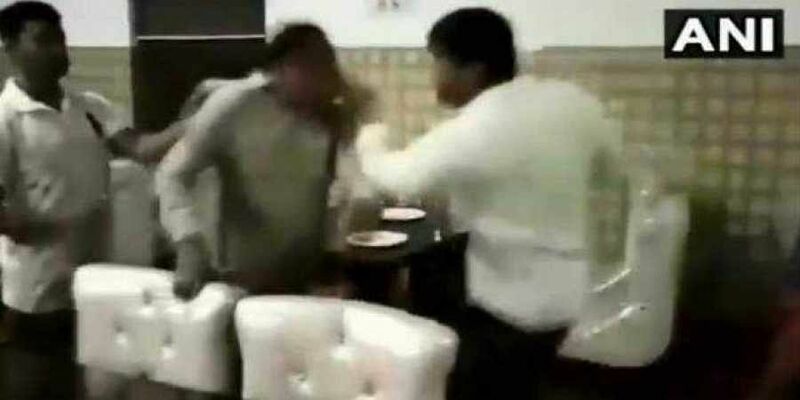 LUCKNOW: A Bharatiya Janata Party (BJP) corporator in Meerut was arrested on Saturday for allegedly thrashing a sub-inspector at a restaurant after an altercation over delayed service. An FIR was filed against the corporator, Manish Chaudhary, following the incident in which he was accused of beating up Mohiuddinpur police outpost in-charge Sukhpal Singh Panwar when the latter was at the Black Pepper restaurant, owned by the former. A video of the incident could be found on social media. According to local police, Panwar, who could be seen in his uniform in the video, visited the restaurant for dinner on Friday night in an inebriated condition and was accompanied by a woman, who is a city-based lawyer. An argument ensued when Panwar’s friend allegedly heckled the staff for quicker service and then allegedly snatched Panwar’s service pistol and trained it at the waiter. “As Chaudhary reached the spot and intervened, confronting the lawyer, the S-I intervened following which, the corporator slapped him and pushed him to the ground,” said Additional Director General, Meerut zone, Prashant Kumar. The situation then turned into a full-blown fracas. The late night brawl, however, caught the district police administration unawares as they were busy with security arrangements for the Dusshera festival.Chaudhary was detained police after the police reached the restaurant and took statements from Panwar, his friend and the restaurant’s staff. “Manish Chaudhary was arrested under non-bailable offences, will be produced before the court on Saturday. His supporters came to the police station to protest, we showed them evidence... The S-I is definitely at fault for he shouldn’t have been there in the 1st place. The probe is on,” said Superintendent of Police (City) Ravinder Singh.Meanwhile, Panwar was sent for a medical examination and was relieved of duty pending an investigation into the matter. Sub-inspector Panwar visited Chaudhary’s restaurant on Friday night, accompanied by a woman, who is a city-based lawyer. An argument ensued with the staff over delay in service and Chaudhary then reportedly slapped and pushed Panwar. Achhey din have arrived in UP.